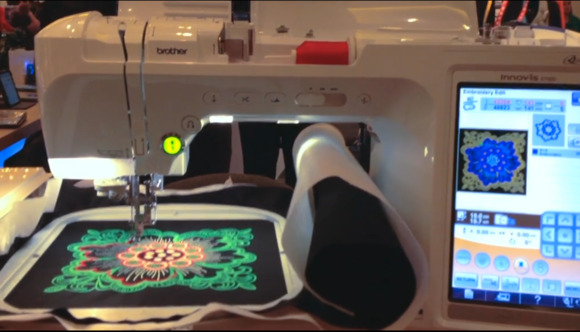 LAS VEGAS—A $10,000 sewing machine is not for the faint of wallet, but Brother International’s new DreamWeaver XE is perfect for budding fashion designers. We watched the DreamWeaver in action at the International CES this week. It lets sewing enthusiasts use embroidery software to upload patterns they’ve designed (or choose pre-loaded patterns). Just install a spool of thread and let the machine do all the work. A $15,000 model that lets you set 10 spools of various thread colors is also available. You might recognize Brother’s machines from their prominent placement in the popular fashion design show Project Runway. One of the show’s past contestants, Anthony Ryan Auld, was a celebrity guest at Brother’s booth during the show. And if $10,000 sounds too steep for a sewing machine, well, consider your dreams of Project Runway fame a lost cause.